First off let me say a big thank-you to all the people who emailed and sent messages of the “get well soon” nature. Much appreciated. Now back to business. 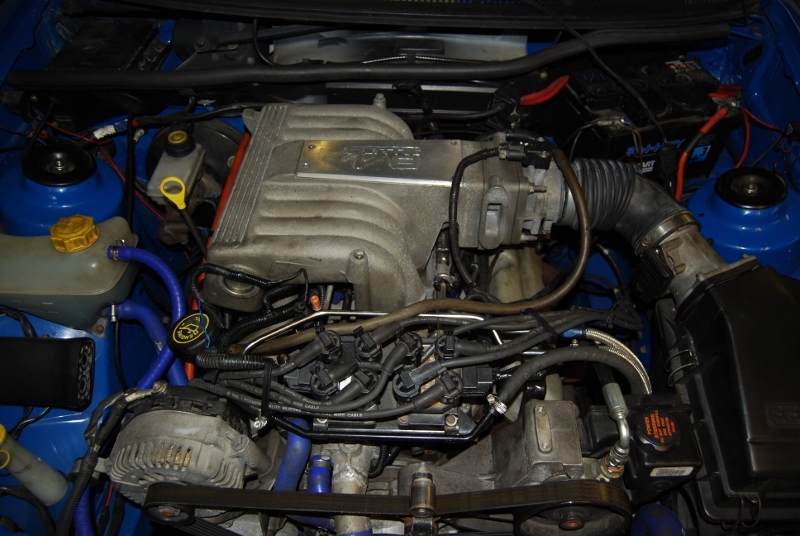 The K Series engine started life as an 1100cc design and became a 1400cc one by the time it went into production. As history relates, it grew to 1600cc, then 1800cc which many people thought was a stretch too far. One of the engineers working on the K Series production line explained to me that there was nothing basically wrong with the engine; it was just that the kit they were making it on was worn out. If you can build it right the 1800K is a reliable engine. Then along comes Mr Petrol-head and bores it out to 1900cc or even a full 2.0 litre. The Elise I had in was fitted with a 1900cc conversion but it was not doing what the owner wanted. He was looking for torque and therefore had stuck with Piper 285 cam profiles, rather than go for an all-out cam to make maximum BHP. After sorting out the fuel and timing we had neither – not a great situation to be in when you have driven down to Norfolk from Scotland. I suspected it might be the inlet trumpets and we had a couple of sets of tapered trumpets and two air boxes. Of the two sets the longer ones were best but still disappointing. 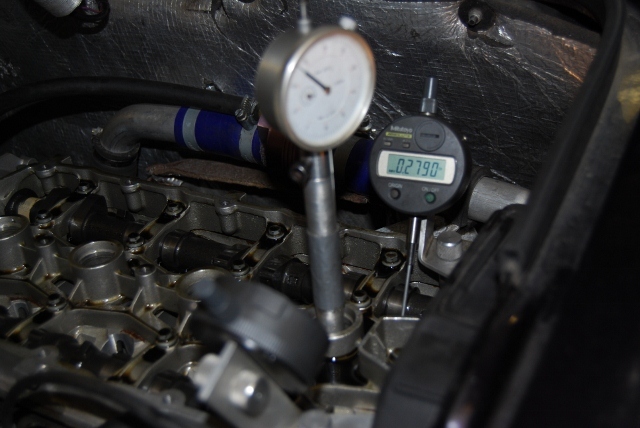 Off came the top of the engine and we fitted up the cam timing dial gauges. Cam timing was, in my opinion, way out so I set to and adjusted the lift on overlap to 3mm on the inlet and 2.5mm on the exhaust. This has always worked for me in the past and I was pretty confident. The result was a spectacular gain in torque and when we fitted the adjustable inlet system the peak torque was up to over 170 ft lbs. It came out as 90ft/lbs per litre which is pretty impressive as road engines go. 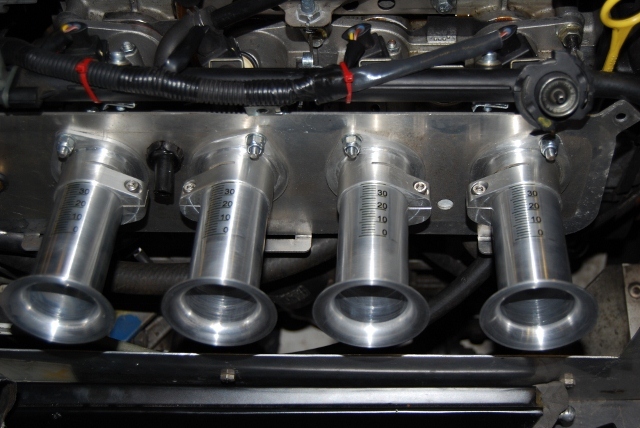 By making small changes in inlet length we ended up with a compromise that still gave us good mid-range torque and a peak figure of almost 220 bhp. After a day like that I am starting to think that I am a bit of a star at this engine set-up business! 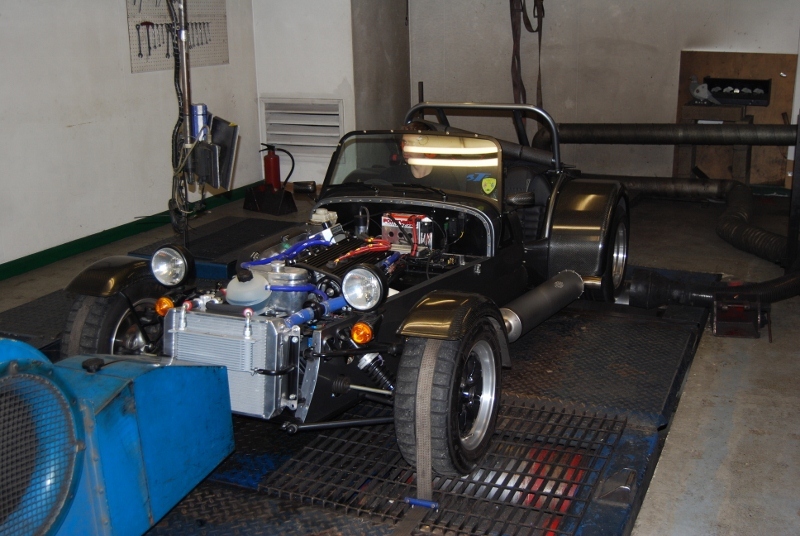 This time it was a Caterham that was getting the 1900K treatment. But to go with the capacity increase we had a seriously big bore 4-1 exhaust, roller barrel throttles and massive 1444 Piper cams. I will not bore you with the details but the result was again, not what we were looking for. Out came the dial gauges and the cam timing was, in my opinion, way out. After the previous day’s result I was really confident, after all, I am a bit of a star at this set-up business. I set the cams to where I knew they should be – based on previous experience. The result was...no different. 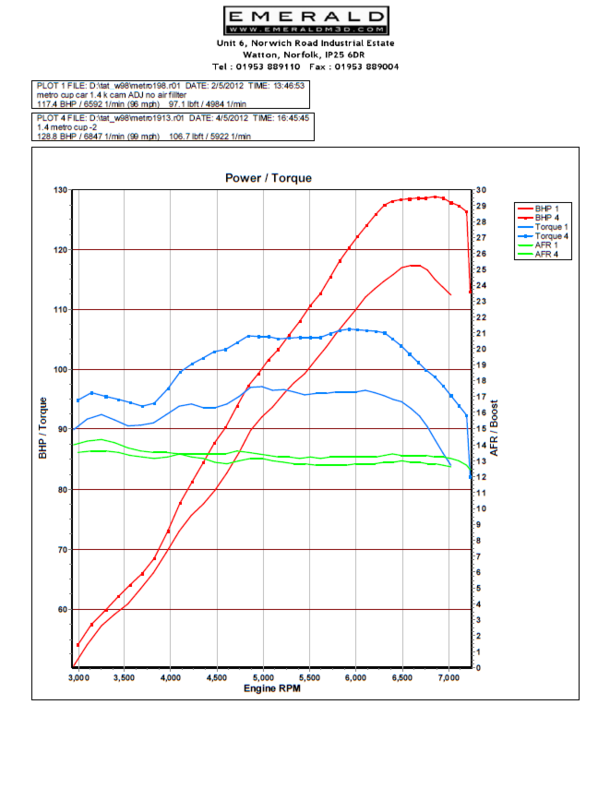 Looking at the waves in the torque curve I was fairly sure that the tract lengths were out but being a tapered system there was nothing I could do about it. The engine still made 230 bhp but we were hoping for more. I seemed to go from hero to zero in just one day – Perhaps I am not very good at this set-up business after all! I was trying to help a guy with a V8 that was doing 3 mpg and had to have the sump emptied of fuel every few hundred miles! Not terribly hard to diagnose when a car is over-fuelling by that much. 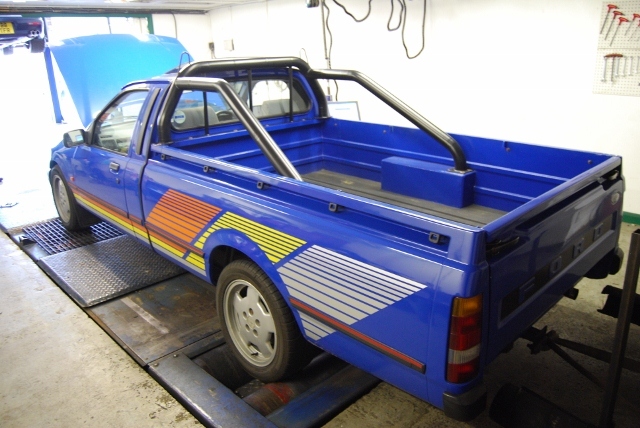 But the owner was sceptical because the engine had been mapped by an expert on a rolling road. Eventually, after an engine re-build, it came here to Emerald and we did some basic checks. The fuelling was off-scale on our mixture reader and the ignition timing was 40 degrees retarded on the reference. The map looked pretty pathetic so we just started from scratch and got it right. Even then it made some 50 bhp less than the previous rolling road had reported but drove a lot better and used a lot, lot, less fuel. What really gave me the hump was that the rolling road hero in question was blaming the ECU and saying that he normally does MoTeC. My point is that if he couldn’t even get the basics right on our ECU then what sort of job would he be doing with an ECU that was more complicated to set up? Just having the kit does not make you a star! It was something of a K-Series month and the little Metro was racing in a Metro series and doing okay. The driver won his class last year but went into the gravel on the first race this year and damaged the engine. It came here for mapping after an engine re-build. The power was pretty poor and we did a basic compression test first. Cylinders 2 and 3 were well down so we followed this up with a cylinder leakage test. This test puts compressed air into the cylinder on compression and you measure how much air leaks out. Trust me, 90 per cent leak is not good news. A road engine will make 10 per cent all day and the best race engines can be as little as 4 per cent once run-in. The car had to be racing that weekend so it was back to base for the car and some serious midnight oil was burnt. Back it came with proper compression after the valves were all lapped in. Just look at the results in the graph. Night and day is the term that springs to mind. 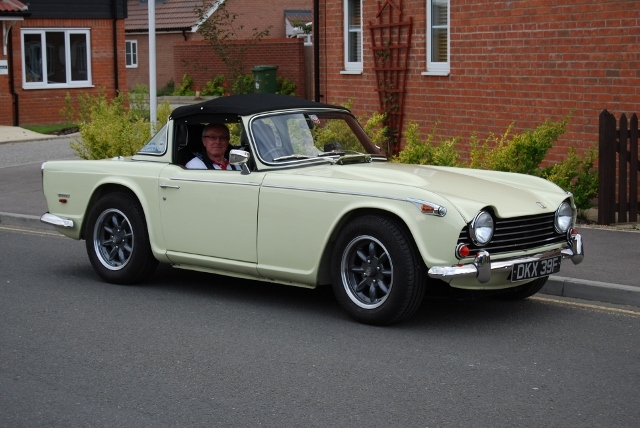 The first time I mapped Harry Dent’s TR5 it made 170 bhp and it was hand-shakes all round. Then a month later it was all doom and gloom as the performance dropped off and the engine lost compression. After a lot of faffing about it was discovered that the cam had worn out and the bits had gone around the engine, basically wearing everything out. No idea where that camshaft came from but it wasn’t good news. 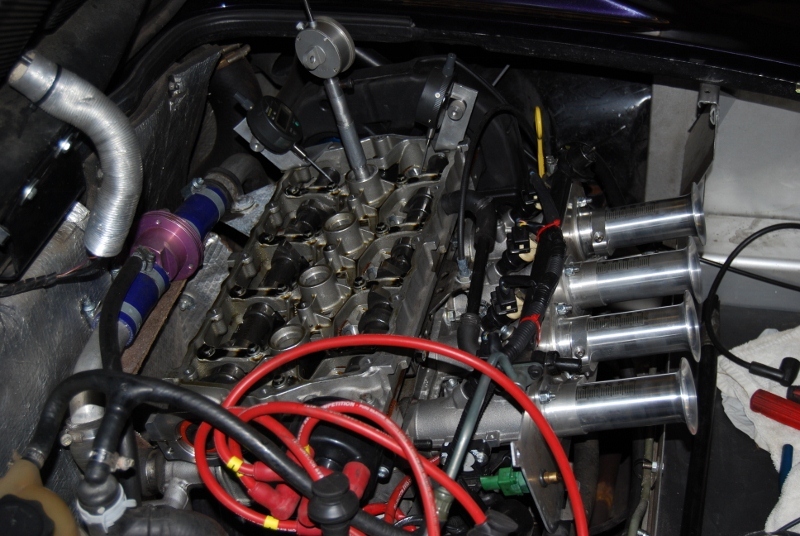 Harry removed the engine and stripped it out, rebuilding it with a Newman camshaft. Back he came for mapping but the result was disappointing. 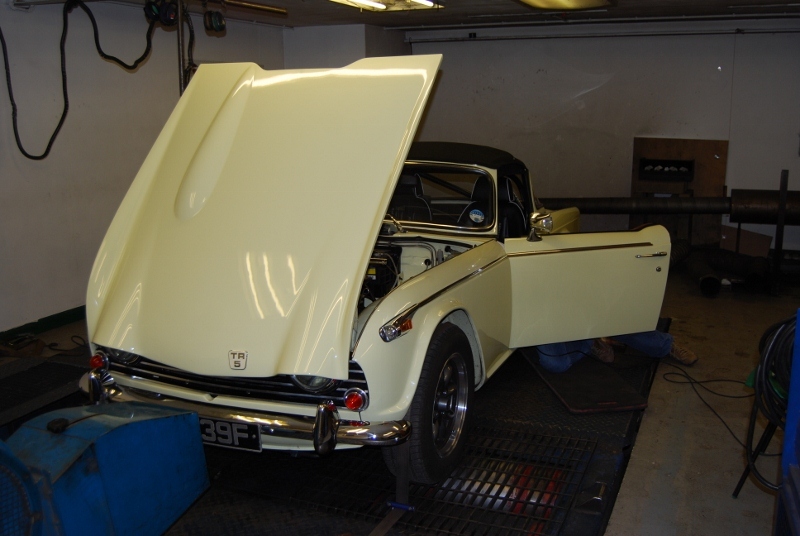 Harry had the fuel consumption and the smoothness he wanted but the power was way down on the first engine. After a long conversation with Newman Cams they offered to replace the cam free of charge and had some ideas on what might give Harry the best of both worlds. Back he came again and this time we had a hell of a result. 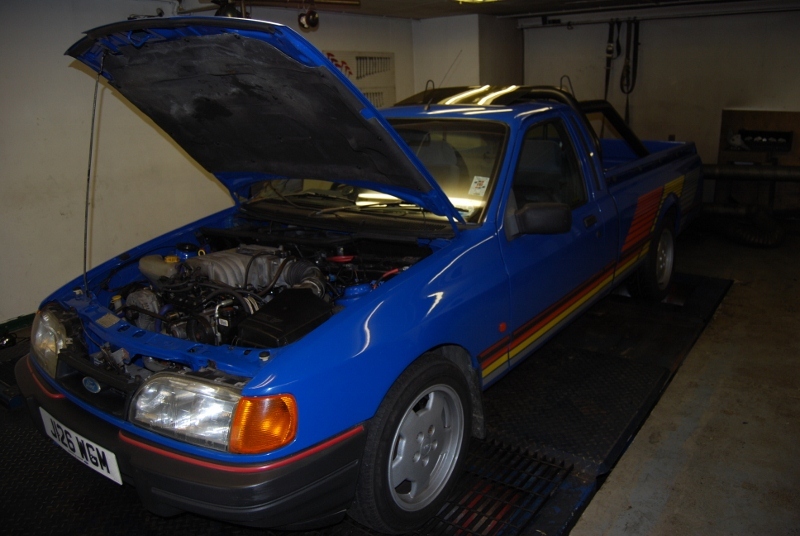 The peak power was 160 bhp but at lower revs than the first engine. The mid range torque was way up on the previous engine so we did indeed have the best of both worlds. Hats off to Newman Cams for the result and to Harry for not giving up.